Mechanical bowel injuries may result from different types of instruments, and may be either blunt or sharp. In the authors' experience, mechanical injuries most commonly occur outside the laparoscopic field of vision. Blind introduction of instruments or retraction, or dissection of the tissues outside of the field of vision is most commonly responsible for mechanical injury. On recognition, the majority of mechanical injuries may undergo immediate repair by intracorporeal suturing, even though the patient has not had a formal bowel preparation. Bowel resection is rarely necessary considering the localized mechanical damage to the bowel. The abdomen is irrigated copiously with 3 to 4 L of saline at the end of the procedure. More significant injuries may require excision of bowel segment, and consultation with a general surgeon should be considered for more extensive injuries. If not recognized intraoperatively, fever, nausea, ileus, and other signs of laparo-scopic bowel injury as previously described develop in the very early postoperative period. Diagnosis is suspected if the patient is not having an expected postoperative recovery. Again, computed tomography scan with oral contrast agent is invaluable and should be performed early if there is any suspicion of bowel injury. Once recognized, immediate return to the operating room for local excision or resection of the bowel with end-to-end anastomosis and peritoneal lavage with saline irrigation is performed. 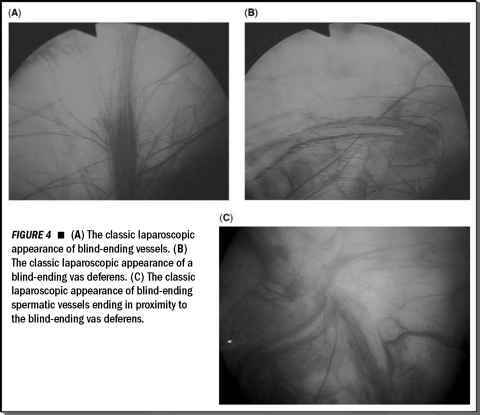 Delicate handling of the tissue and care during introduction of the instruments through the laparoscopic trocars, preferably under direct vision, should prevent mechanical bowel injury. Additionally, instruments should not be left unattended within the abdominal cavity while they are not in use.